High noon, it was, and such a strange hour to come to the village well. This woman tried to sneak around right there in the bright, hot sun. She plotted to drop her pail, get her water, and be gone before anyone could notice her. Her ways were well known in Sychar; the tawdry details of her life filled the gossipy chatter that often went on here. The “water cooler” talk of those days revolved around her many failed relationships. She’d become fairly adept at fast-filling her pot and getting home. This way she avoided her neighbors who brought their buckets during the day’s cooler hours. This day would be different, however. She would find a Man – tired from travelling and all alone – resting at the well. She moved quickly, wanting to get her water and escape. Maybe this Man would be too weary to take note of her presence. Men! They always presented problems for her. She knew them pretty well – she had encountered quite a few during her years. Mostly, they had left her disappointed and disillusioned. She sized up this one with a quick glance and discerned that this Man was Jewish. That bit of information caused her to relax – Jews don’t speak to Samaritans like her, she reasoned, and she let down her guard. Those words struck a chord within her. “Sir, give me this water,” she said. Her words carried a tone of hope. This touched her like no other promise she had ever heard before. Could it be true? 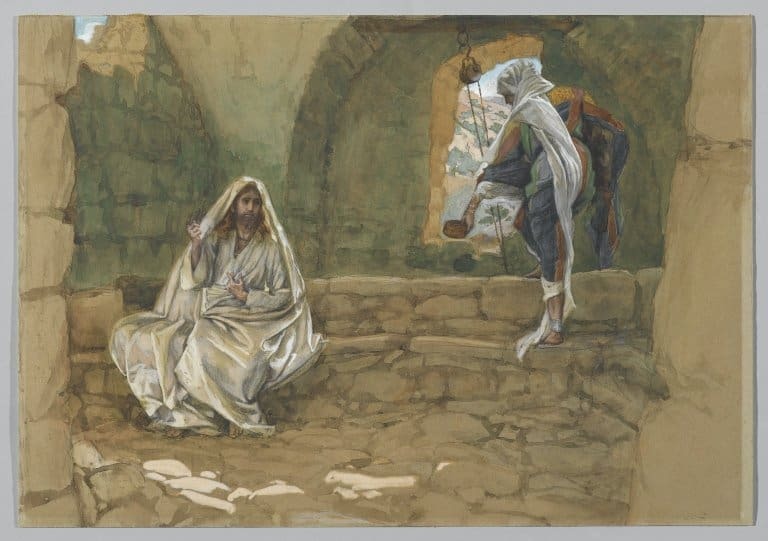 When Jesus asked her to first fetch her husband, her answer was, for once, honest and forthright: “I have no husband.” Something big began to happen, a saving thing, a redemptive encounter unfolded. There was no deception in her now. She withered as Jesus recounted her relationship history – five broken marriages and the unlawful living arrangement she had with her present partner. She knew a bit about religion – perhaps she had tried to worship the Lord. The mount near Sychar had been something of a holy place. At that time, among the peoples of the region, Samaritans were ostracized and none dared try to make his way to the Jerusalem Temple to make an offering. Yet in that moment, we see Jesus begin to define what worship really is. It is a matter of the heart, not a matter of place and time. “The hour is now that true worshippers shall worship the Father in Spirit and in truth,” He declared to her. “I AM the One,” Jesus said to her. It was a direct, declarative statement defining the reality of who He is. This weary, worn out, thirsty woman got the message straight from the Messiah’s lips. He came to this woman, told her her own story as only He could tell it, and then revealed Himself to her. Result: she became a witness. Suddenly full of living water, she dropped her bucket and ran back to the village. She gathered her neighbors and led them out to meet Jesus. His words touched many from her town. His message was so profound to them that they begged Him to keep talking. Jesus and His disciples stayed in a Samaritan village for two more days. “We have heard him ourselves and know that this indeed is the Christ, the Savior of the world” was the testimony of Sychar’s people. This is how God works His wonders in the fields that are ready to harvest. There are people everywhere who are thirsty for life. They struggle under the weight of their bad choices and poor surroundings. And, then, Jesus shows up, making Himself known. He has made us for this work. He has spoken to us about who He really is. May we respond as this woman did. May we be mighty witnesses for the reality of the Christ, the Savior of the World.